Time travel is easier than you think when Rockingham Castle will transport visitors back more than 150 years with a special festive event. It’s Christmas Eve 1849 and excitement ripples through the Castle. The trees are decorated, the silver is shining in the Great Hall, the kitchen is smelling delicious and the gifts are nestled beneath candlelit boughs. The Watson family are celebrating and their servants are stealing a moment to take you around the Castle in all its festive glory. Will you meet the butler at the door or a footman lighting candles for dinner? Will the housekeeper be sewing last minute gifts in the Panel Room or perhaps the governess will be tidying away toys in the Long Gallery? Come and experience the magic of Christmas in this unique setting sure to get all the family in the mood for festive fun. It runs from Monday to Friday November 21 to 25. The first tour of the Castle at 11am. Tours run every 15 minutes throughout the day with the last tour at 7.30pm. 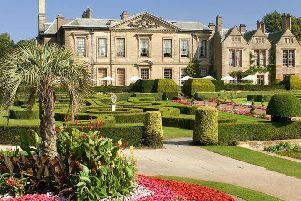 For additional information or to book tickets for the tours call 01536 770240 or visit www.rockinghamcastle.com.